African moon moths are now emerging! The African moon moth (Argema mimosae) is another spectacular large moth found at Butterflies & Blooms this summer. 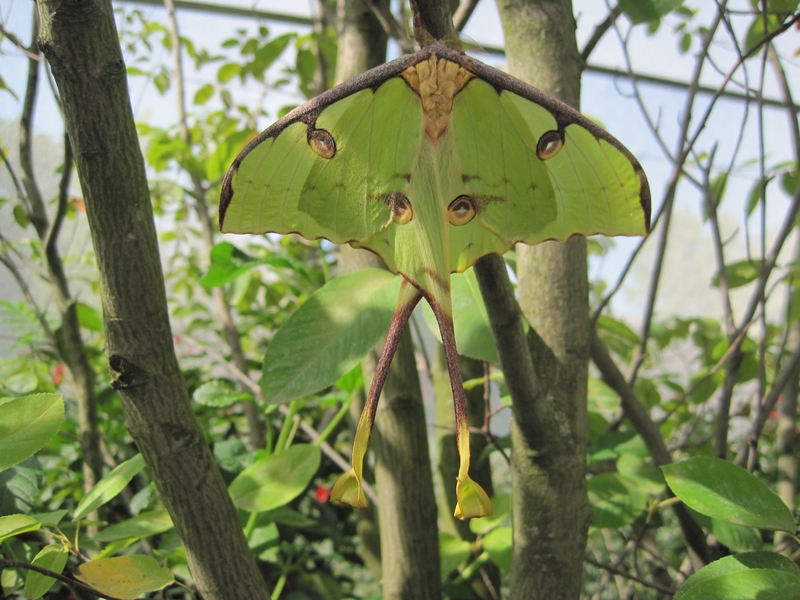 Slightly smaller than its cousin, the Giant Madagascan moon moth, or comet moth (Argema mittrei), it can be well-camouflaged among the branches in the exhibition because its bright, bright green color blends in well with new leaf growth. The four “eyespots” on the moon moth’s wings mark it as a member of the Saturniidae family—moths with concentric spot designs that mimic the rings on the planet Saturn. Saturnid moths also use a pheromone mating system in which female moths release a chemical scent trail for male moths to follow. As a caterpillar, this native of South Africa prefers corkwood (Commiphora), marula (Sclerocarya birrea), and tamboti (Spirostachys africana), but it does not eat during its lifespan as a moth. It trades mouthparts for wings in its transformation. It also trades its green caterpillar body for a beautiful, furry coat! Find male moths in the exhibition by checking their antennae—male moths have thicker, more strongly feathered antennae. Great photo and awesome story!